Pemberton United Methodist Church is a place where all are welcome despite your race, gender, social status or orientation. This is a church where the love of God meets you wherever you are in life. We stand on the words of John Wesley, the founder of the United Methodist Church, who once purported, “I want the whole Christ for my Savior, the whole Bible for my book, the whole Church for my fellowship and the whole world for my mission field.” We are a church who strives to reach the mission field of Pemberton and the world! As a part of our “Roadmap to Renewal” effort a few years ago we needed to come up with a mission statement. 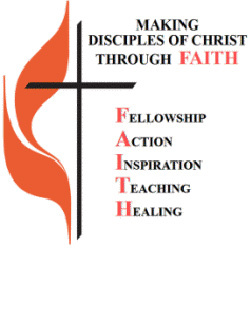 It was the creative thinking of Rob Challender who came up with the idea of tying words to FAITH, which defined the actions that we take to make Disciples of Christ. A poster was created with this insignia on it and was adopted by the congregation with all in attendance signing that document. It now hangs in the Chapel where it is a constant reminder of our commitment. F is for Fellowship, which is a very important part of Christian life. Through constant fellowship and support, we encourage each other to keep the faith. A is for Action that each of us individually and as a group will take to serve the community of God’s people. I is for Inspiration, which is needed to help us in our understanding of God’s calling for us. is for Teaching each other and God’s people so that there is an understanding of what it means to be a Christian. is for Healing, both physically, mentally and spiritually as the faith we share helps to carry us through each day.